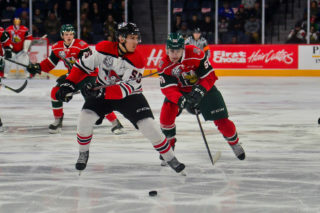 The Mooseheads have began their 25th anniversary season with the best start in franchise history and they added to that on Sunday in Moncton. Halifax made it four consecutive victories to begin the year after taking down the Wildcats 4-2 at the brand new Avenir Centre. First star Arnaud Durandeau continued his torrid pace with another goal and two assists and he is among the early QMJHL leaders with eight points. The New York Islanders prospect scored the game winning goal in the final minute of the second period when he took a pass at the Wildcats blueline and used defenceman Jordan Spence as a screen before wiring a nice wrist shot by goalie Francis Leclerc. Fans erupted with cheers, but they weren’t the home fans. 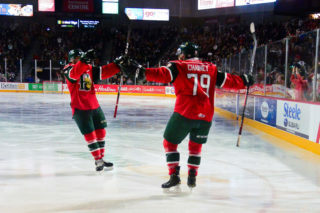 The Mooseheads had a special support group of about 100 in attendance with two fan buses making the trip to the hub city. “They were so loud. 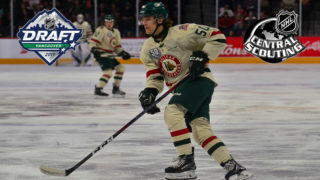 Antoine Morand was in the room (after taking a late period penalty) and he said he thought that it was a Moncton goal,” said Moose forward Samuel Asselin after the game. Asselin, along with Jocktan Chainey, helped to make sure their teammates stayed on the ice to salute the fans after the final horn. The players raised their sticks in appreciation of the vocal group at the other end of the ice. Moncton opened the scoring on Sunday afternoon when Adam Capannelli spun around and whipped a shot past Alex Gravel just over four minutes into action. The Herd fought back to tie it 1-1 on a gorgeous short-handed breakaway goal by Antoine Morand as he notched his first goal in a Mooseheads uniform. Halifax was then able to grab their first lead of the game when Jordan Maher beat the buzzer at the end of the first period by lifting a high backhand shot up and under the bar with less than one second remaining. The goal went to video review before referee Jonathan Langille made it official by pointing to centre ice. Simon Le Coultre pulled the Cats even only 17 seconds into the middle stanza and the score remained tied until 19:18 when Durandeau tallied his game-winner. Jocktan Chainey added another in the third period to make it a 4-2 game. Moncton appeared to get one back with 7:33 to play when the puck dribbled through the pads of Alex Gravel during a scrum in front of the net but the whistle had gone as Brady Pataki was called for a high sticking major on the play. Both goalies were busy and made their fair share of spectacular saves throughout the game. Gravel became the first goalie in the league to reach four wins on the season with a 32 save performance. He is 4-0 with a 2.48 goals against average and a .925 save percentage. Francis Leclerc made 33 saves while taking the loss for the 2-2 Wildcats. The win marks the 350th career QMJHL regular season victory for Head Coach Eric Veilleux. Forward Ostap Safin left the game early after suffering a lower body injury. He is being re-evaluated to determine the extent of his injury. 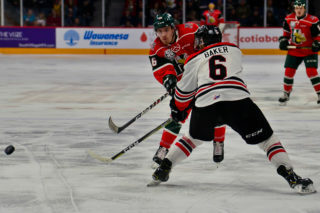 He joins Jared McIsaac, Samuel Dube and Kyle Petten on the shelf as the Mooseheads prepare to venture into the province of Quebec for the first time this season. The team will be gone for the entire week with visits to Quebec City on Wednesday, Chicoutimi on Friday and Baie-Comeau next Saturday. 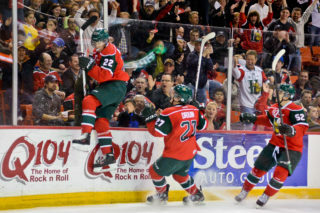 The Mooseheads home opener is scheduled for Saturday, October 27th at 7pm versus the Cape Breton Screaming Eagles. Individual tickets will go on sale on October 3rd at 11am. Mooseheads 2018-19 Season Ticket Memberships and 15-Game Packs are on sale now at TicketAtlantic.com, the Official Mooseheads Shop in Scotia Square or by calling 451-1221.